Why was this event significant? The New Deal was significant because it sought to deliver relief, recovery, and reform to the American people during the Great Depression. When President Roosevelt first took office in 1933, 50% of America’s workforce was unemployed. President Roosevelt acted quickly and efficiently to put people back to work. He created the New Deal, which employed many Americans to build and improve the nation’s infrastructure and create works of art and culture. The relief part was meant to relieve extreme poverty. The recovery part of the New Deal meant to get the US industry going again. The reform aspect of the New Deal dealt with making the US a better place for the people to live in. The New Deal impacted America greatly. The impact it had on America was that it aimed to help people in need and give them jobs. The New Deal also impacted America by getting money back into circulation and to bring back confidence in the capitalists system. 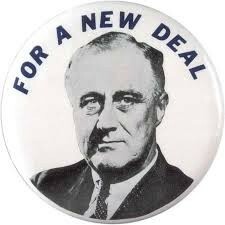 Many acts from the New Deal were very successful and they are still in place today. The New Deal also impacted American Literature. During this time there were acts put in that gave thousands of artists, writers, actors, film makers, musicians, and dancers jobs. These acts were called the Federal Writers' Project, the Federal Theatre Project, and the Federal Music Project.